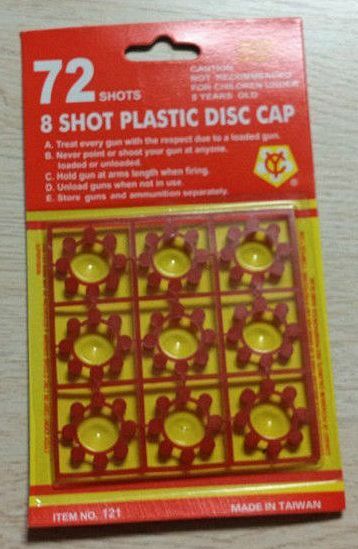 Package of nine 8 shot cap rings. Total of 72 shots. Fits cap guns that use cap rings, such as 8 Shot 38 Special Super Cap Gun. Order at least twice as many cap packages for each cap gun you order. You'll probably still sell out of cap refills! If you are working an outdoor event where children are allowed to play on the grounds, such as pow wows, reenactments, and some festivals, this can be a great seller. If you give the first two boys you see a free gun and a box of caps each, you'll have lively sales of this item within the hour, which will continue all weekend. You can easily sell a case of guns and at least twice as many caps over the weekend. Price is for one dozen cap cards. Also a popular party favor for little boy's birthday parties or at family reunions.